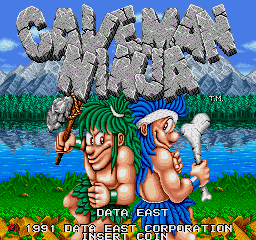 Caveman Ninja © 1991 Data East Corporation. Caveman Ninja is a horizontally-scrolling platform beat-em-up set in prehistoric times with one or two players taking on the roles of cavemen Joe and Mac. Rival caveman have invaded Joe and Mac's village and kidnapped all of their women and it's up to the two heroes to venture forth and save them. Joe and Mac must battle through numerous prehistorically-themed stages, fighting enemy cavemen and marauding dinosaurs. The heroes are initially armed with throwing axes that can be tossed either vertically or horizontally, travelling in a short arc. By holding down the attack button, larger, more powerful weapons will be thrown. When close to an enemy, Joe and Mac will utilise a wooden club to whack them. Players can also jump much higher by holding UP and JUMP. Joe and Mac each have a life meter that gradually depletes over time, with additional energy losses incurred when players are hit by a enemies or projectile. Food can be collected from defeated enemies to top up the players' energy levels. Different weapons can be found throughout the stages including stone wheels, fireballs, and shadowy doppelgangers that charge forward and attack enemies. Other power-ups include hot sauce or jalapeno peppers that give players temporary invincibility and fiery breath. Certain enemy strikes - such as being hit by a thrown boulder - will flatten Joe and Mac like pancakes for a few seconds, although they can still move and attack while in this form, albeit more slowly. During the simultaneous two-player game, both characters are capable of damaging each other. The game allows players to select between different routes after each boss battle. Also, after defeating the final boss, the players can choose between three exits, each one leading to a slightly different ending sequence. 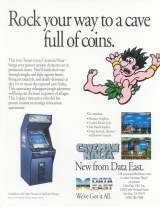 Caveman Ninja was released in February 1991. This game is known in Japan as "Tatakae Genshijin - Joe & Mac" (translates from Japanese as 'Fighting Cavemen - Joe & Mac'). A bootleg of this game is known as "Stone Age". Michael Jackson used to own this game. It was sold at the official Michael Jackson Auction on April 24th, 2009. [EU] Nintendo NES (1992) "Joe & Mac: Caveman Ninja [Model NES-CJ]"
[US] Nintendo SNES (jan.1992) "Joe & Mac [Model SHVC-JT]"
[US] Nintendo NES (dec.1992) "Joe & Mac [Model NES-CJ]"
[EU] Nintendo Game Boy (1993) "Joe & Mac: Caveman Ninja"
[US] Nintendo Game Boy (june.1993) "Joe & Mac"